Google has been making a lot of moves lately as they have been acquiring several companies in order to expand their horizons. 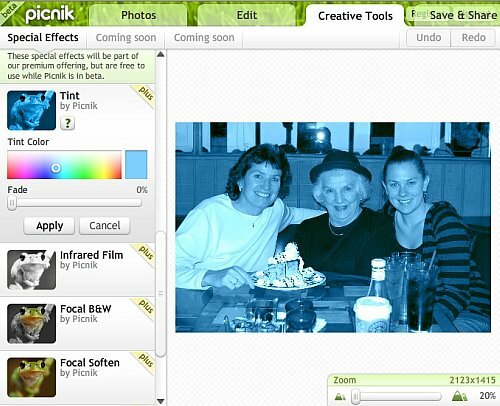 Google has recently acquired Picnik, which is an online photo editing company. For years the main way to make photo changes and editing was primarily available through software installed on your computer. Picnik changes the game where you do not have to download any software whether it be free or cost money. Picnik is an internet based solution to where users can register an account and then start editing. Some of the features of Picnik is you can crop, touch up, resize, add effects, whiten teeth (my favorite) and more within whatever web browser you choose. A lot of people have been using Picnik for scrapbooking purposes, professional photographers, graphic designers, and others who just want to do some photo editing. Google said that they have been very impressed with the Picnik team and the product they have created. While you may not see any changes right now with Picnik, there is going to be some collaboration with the Picnik team and Googlers as they create new features and perform some integration with existing Google products. Google will continue to support the existing partners of Picnik so users can upload photos to Picnik from other photo sharing sites. Photo editing on the cloud is an exciting move as more and more companies are making the move to cloud computing. Google has always had their hand in the cloud computing jar and I imagine we will see more companies on the cloud that will be acquired by Google. With social media becoming more and more popular and users uploading pictures online everyday this is a great move for Google and users as the Picnik team can now lean on some of Google’s expertise and technology.